Kyoto is an ancient and refined city. It’s the former Imperial Capital of Japan, a place of historical and cultural importance that’s played an integral role in Japanese narratives for centuries. From beautiful cherry blossoms to intriguing temples and castles, thousands of years of Japanese history can be found on the streets of Kyoto, and thousands of years of culinary traditions can be found in the markets and in the restaurants of this city. Honed, developed and mastered through the ages, Kyoto’s contemporary food culture is constantly developing and evolving, taking traditional methods and ingredients, and blending them with modern influences to produce a distinct, local style that’s begging to be explored by visitors to the city. From classic Japanese dishes to unusual Kyoto favorites, there’s a lot of food to try in the city, and, as anywhere in Japan, the etiquette and tradition are as important as the ingredients and the cooking. To help you successfully eat your way through the streets of this Japanese city, here is everything you need to know about food in Kyoto. The Japanese take their food seriously. And with good reason. Their distinct styles and specialties are ancient institutions, and eating, of course, is an important part of life and something that should never be rushed. Before getting to grips with Kyoto’s various dishes, snacks, and culinary delights, let’s explore the complex etiquette involved in Japanese dining, to prepare you for when you sit down and are ready to indulge. Chopsticks are an important part of Japanese food culture. For visitors to Kyoto who are not used to using these eating implements, it can take practice to handle them expertly. Keep trying and your efforts will certainly be appreciated, however. When it comes to eating with chopsticks in Japan, never use them to point at anyone or anything. This is considered bad form. They are there for eating, not pointing. They are also not there for stabbing food, but for gently lifting food towards your mouth. Master the chopsticks and dining in Japan will become infinitely easier. Traditionally, meals in Japanese homes are eaten while sat on a cushion on the floor, around a low table. Men usually sit cross-legged, and women with one leg to the side. In modern restaurants, this tradition is continued, with many seating areas comprising low tables and cushioned areas, however, many modern restaurants are likely to also have western style chairs and tables in Kyoto. Each dish can potentially have a different way of being eaten. Miso soup must always be drunk, not consumed with a spoon, while noodle soup must be eaten with chopsticks and curries with a large spoon. Japanese culture is very polite and it pays to be well mannered and to, at the very least, attempt to follow local customs to show you are not so ignorant of the culture when dining in Kyoto. Kyoto has a rich culinary tradition, and many of today’s dishes and elaborate presentation of meals can be traced back to the city’s long history as Japan’s Imperial Capital. There are distinct styles that are the direct descendants of the high class, ruling imperial culture, while other dishes are influenced by the strict, vegetarian diets of the many monks found in the city. There’s almost too much to try in just a single trip and you will soon find yourself returning time after time to Kyoto to immerse yourself even further in the wonderful culinary scene. Here are the city’s most famous and interesting specialties that you have to try when visiting. Kaiseki Ryori is Japan’s traditional style of fine dining. It’s a historic institution, a process refined over centuries by the Imperial ruling class of Japan, which is now available to everyone. Enjoying Kaiseki in Kyoto is not just a meal, but an experience. It’s an elaborate presentation of multiple courses and dishes, which together display the finest quality cooking and talents of the chefs preparing it. This beautiful tradition evokes everything noble about Japanese culture. The dishes are prepared individually, to showcase the best ingredients and talents of those cooking, and it’s the chefs that generally decide what will be served at the table, not the guests who are dining. The actual dishes involved vary each time, as each selection tends to be unique, but expect a thorough journey through Japanese cuisines, with rice dishes, fish, and tofu to name a small part of the selection. The experience will usually end with a tea ceremony – more on that later. Although it’s an ancient establishment in Kyoto’s culinary scene, it’s also an ever-changing process, and Kaiseki is becoming more and more extensive and experimental in many establishments, without diverting from its origins. Kaiseki Ryori is really a selection of the finest food and dishes on offer. As something that was previously reserved exclusively for nobility, it can still carry an expensive price tag. It’s an experience not to be missed, however. There are many fine restaurants across the city serving Kaiseki Ryori and each has its own distinctive style. One of the best in the city is the Michelin-starred Kiyamachi Sakuragawa, a refined place where you can watch the master chef prepare each dish individually and gain an insight into the beautiful process that goes into selection and creation. A cheaper, more accessible option for those just venturing into the complex world of Kaiseki Ryori is the Gion Karyo restaurant. It’s well priced for this tradition and, although aimed at tourists, is an excellent way to experience this culture for the first time. Shojin Ryori is in many ways very similar to Kaiseki Ryori, but in many ways, it’s very, very different. Kyoto is famed for its diverse array of vegetarian food. Historically, the city has always been the home of many of the country’s Buddhist monks who are traditionally vegetarian. That means that over the years, this influence has led to the creation of some very excellent vegetarian dishes. Shojin Ryori exemplifies this vegetarian culture. Like, Kaiseki Ryori, it’s a multi-faceted meal with many different dishes. Unlike Kaiseki Ryori though, Shojin Ryori is exclusively vegetarian and rather than being formed for the enjoyment of nobles, this is a culinary style created for the humble monks of Kyoto. This type of cuisine focuses on healthy, seasonal vegetables and it’s brilliant for anyone trying to eat healthy food while in Japan. There are many great restaurants where you can experience this authentic Kyoto tradition in the city. Many are found within old temples, still serving in the same styles they have been perfecting for hundreds of years. One of the most interesting places to try Shojin Ryori is at Shigetsu, a restaurant found within the beautiful grounds of the UNESCO World Heritage Site of Tenryu-Ji Temple, offering not just a culinary experience but a cultural one too. Another great choice is the Izusen vegetarian restaurant, which is found within Daiji-in Temple in Kyoto. This restaurant, again within the confines of a traditional Buddhist temple, specializes in serving up Iron Bowl dishes, a throwback to the iron bowls of old that monks used to collect alms in the city. A meal of Obanzai Ryori is one of the most local experiences you can enjoy while staying in Kyoto. It’s a favorite in the city, as it involves simple, home-cooked food, using recipes that have been passed along from family to family through the ages. It’s food that traditionally would have been consumed at home, in a family setting, but that in today’s fast-paced world has been taken onto the streets and is now being served up in authentic Obanzai restaurants across Kyoto. Obanzai involves plenty of fresh and seasonal vegetables. In Kyoto, expect plenty of tofu to accompany the staples of miso soup and rice. An Obanzai Ryori dining experience will be cheaper and much more casual than Kyoto’s other famous styles, but the cooking will still be incredible. Being very local affairs, visitors may struggle if they don’t speak Japanese, as many of the best Obanzai Ryori restaurants are only really used to catering to Japanese customers. That’s all part of the enjoyment and the experience though. There are hundreds of small, rustic eateries to be found across Kyoto, and it’s easy to find good food by simply strolling through the streets and following the glorious smell of home cooking to where the locals go for dinner. 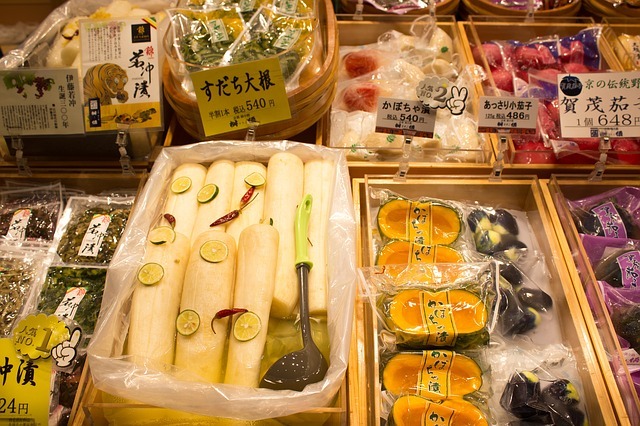 Kyoto is famous for its vegetarian delicacies and a huge constituent of that fame comes down to the delicious tofu dishes found across the city. There are many different styles of tofu production and cooking. One of the reasons that it’s very easy to be a vegetarian in Kyoto is the extent of those different methods when it comes to preparing and cooking tofu. The two most well-known examples of this tofu tradition are Yudofu and Yuba dishes. Yudofu is a delicious creation that involves the simple method of just boiling tofu. It translates into English as hot tofu, and it’s best enjoyed in the cold winter months. Yuba is literally just tofu skin but prepared correctly it’s a delicious speciality that the chefs of Kyoto know how to cook delicately and beautifully. Kyoto is famous not only for its elaborate meals and simple dishes but also for its drinking culture. Not just alcoholic beverages, but green tea ceremonies, which are an integral part of Japanese culture in the city. Many meals, especially the noble Kaiseki Ryori dinner, will end with a green tea ceremony, while this fabled tradition can also be experienced on its own across the city. Kyoto’s particularly unique type of tea is known as Matcha. Done properly, a matcha tea ceremony is an event that comprises many elements, but that ultimately is a custom meant to bring tea drinkers closer together, to form trust and to help them to bond in a quiet, peaceful and tranquil environment that calms the nerves and relaxes those involved. Matcha tea has an unusually green and vibrant color compared to standard green tea, as this particular tea contains a much higher quality of tea leaf that is said to retain many more nutrients. A traditional tea ceremony involves certain movements and traditions that must be learned and enacted in a certain manner. It’s the most traditional ceremony to be involved in within Japanese culinary culture. Japan’s most famous – and perhaps after a night out with the Japanese, most infamous! – beverage is Sake. Kyoto is well known as a center of Sake production because the clear, pure mineral water that flows from underground springs across the city gives brewers a beautifully clean ingredient to produce their drink with. There are several Sake breweries around the city. The most well known are in the Fushimi District, an area that historically produced some of the finest sake in Japan. In Kyoto, it’s easy to find good Sake and it’s usually enjoyed as an accompaniment to dinner. Drinking Sake has its own rituals too, as much as drinking tea or eating dinner does in Japan. A toast is given when the first glasses are raised, as everyone drinking must say ‘Kampai’, the traditional Japanese drinking cheers, while it’s common not to fill your own glass, but to help other by pouring their glass for them. After a few Sake though, many of these rules may begin to be forgotten! Kyoto is a culinary heaven for food lovers and culture vultures. Try something new when you visit the city, and learn how to cook Kyoto’s best and most famous culinary dishes during one of our cooking classes. Get in touch today to find out more!